In the first video of this series we spoke in depth about my concept of Metric Modulation both actual and implied. For those who don’t remember or didn’t see that video, yet. In Implied Metric Modulation we’re merely pretending to speed up or slow down by using a different sub division. For example playing a groove based in eighth notes, then playing the same physical pattern within eighth note triplets which would sound as if you sped up. The implied pulse works around our actual quarter note pulse. It’s an illusion. Alternately, when playing an Actual Metric Modulation we really are speeding up or slowing down in a way that is relative to our original tempo. If we use the same example described for implied, our faster beat would represent the new pulse and we would be at a new BPM. 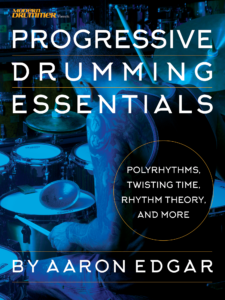 We’re going to touch on how the modulations can relate to polyrhythms in this video as well. Briefly, but it’s there. In the first three examples, they’re all based off the same type of phrasing. These first three all work from a three over two polyrhythm. If you were to play a three over two against the original groove in the video, when I switch over to the modulation, my implied pulse will directly correspond to your “three”. As you can see, examples one through three are based off the same rhythmic concept using a couple different embellishments. Notice where the pulse notes (kicks on 1 and 3 and snares on 2 and 4) line up within the modulations. You can use this as framework to design your own feels! The next example deals with a three over four polyrhythm based modulation. Taking a basic sixteenth note groove and applying it within an eighth note triplet subdivision. Finally, we’ll do the opposite. Starting with a triplet based groove and implying a speed up via four over three in sixteenth notes! All these concepts within the subdivisions chosen in this video are very simple once you break them down. Don’t take that as a reason to not bother with them, though. Getting these kind of modulations comfortable in your playing will do wonders for your applications when we break into the more challenging versions! In this video I’m only going to show you basic physical examples of modulations. It’s up to you as the player to decide weather you want them to resolve naturally, or if you want to force them to resolve based on your phrasing. Same with if you want to dress up your transitions with fills or not. This is all stuff we’re going to talk about in future videos. I hinted at it in the original Metric Modulation Vs. Implied Metric Modulation video. If you can’t wait, just go ahead and try it! Finally, before I sign off here, make absolutely sure you apply YOUR OWN grooves to these concepts! That’s where the real magic comes in! It’s one thing to read these ideas off a screen or a book. It’s entirely more personal when you take your own favourite grooves and slap them into a different subdivision! You’ll get way more mileage out of the concept when you make it your own. That’s it for me today! Have fun with these and I’ll see you inside the next video! And kijkenify : Yes, I actually do LOVE my extremely dark cymbal sounds. Bright sounds have always bothered me, I just can’t get into them. They kind of make me feel sick! And kijkenify :﻿ Yes, I actually do LOVE my extremely dark cymbal sounds. Bright sounds have always bothered me, I just can’t get into them. They kind of make me feel sick! And kijkenify : Yes, I actually do LOVE my extremely dark cymbal sounds. Bright sounds have always bothered me, I just can’t get into them. They kind of make﻿ me feel sick! And kijkenify : Yes, I actually do LOVE my extremely dark cymbal sounds. Bright sounds have always bothered me, I﻿ just can’t get into them. They kind of make me feel sick! And kijkenify : Yes, I actually do LOVE my extremely dark cymbal sounds. Bright sounds have always bothered me, I just can’t get into them. They kind of make me﻿ feel sick! And kijkenify : Yes, I actually do LOVE my extremely dark cymbal sounds. Bright sounds have always bothered me, I just can’t get into them.﻿ They kind of make me feel sick! And kijkenify : Yes, I actually do LOVE my extremely dark cymbal sounds. Bright sounds have always bothered me,﻿ I just can’t get into them. They kind of make me feel sick! And kijkenify : Yes, I actually do﻿ LOVE my extremely dark cymbal sounds. Bright sounds have always bothered me, I just can’t get into them. They kind of make me feel sick! And kijkenify : Yes, I actually do LOVE my extremely dark cymbal sounds. Bright sounds have always bothered me, I just can’t get into them. They kind﻿ of make me feel sick! And kijkenify : Yes, I actually do LOVE my extremely﻿ dark cymbal sounds. Bright sounds have always bothered me, I just can’t get into them. They kind of make me feel sick! And kijkenify : Yes, I actually do LOVE my extremely dark cymbal sounds. Bright sounds have always bothered me, I just can’t get into them. They﻿ kind of make me feel sick! And kijkenify﻿ : Yes, I actually do LOVE my extremely dark cymbal sounds. Bright sounds have always bothered me, I just can’t get into them. They kind of make me feel sick! And kijkenify : Yes, I﻿ actually do LOVE my extremely dark cymbal sounds. Bright sounds have always bothered me, I just can’t get into them. They kind of make me feel sick! And kijkenify : Yes, I actually do LOVE my extremely dark cymbal sounds. Bright sounds have﻿ always bothered me, I just can’t get into them. They kind of make me feel sick! And kijkenify : Yes, I actually do LOVE my extremely dark cymbal sounds. Bright sounds have always bothered me, I just can’t get into them. They kind of make me feel﻿ sick! And﻿ kijkenify : Yes, I actually do LOVE my extremely dark cymbal sounds. Bright sounds have always bothered me, I just can’t get into them. They kind of make me feel sick! And kijkenify : Yes, I actually do LOVE my﻿ extremely dark cymbal sounds. Bright sounds have always bothered me, I just can’t get into them. They kind of make me feel sick! And kijkenify : Yes, I actually do LOVE my extremely dark cymbal sounds. Bright sounds have always bothered﻿ me, I just can’t get into them. They kind of make me feel sick! And kijkenify : Yes, I actually do LOVE my extremely dark cymbal sounds. Bright sounds have always﻿ bothered me, I just can’t get into them. They kind of make me feel sick! And kijkenify : Yes, I actually﻿ do LOVE my extremely dark cymbal sounds. Bright sounds have always bothered me, I just can’t get into them. They kind of make me feel sick! [..YouTube..] Thanks a lot guys! @aaronedgardrum Great response Aaron. I love how you are not precious with the some of the negative comments that goes with the Youtube territory. I myself would not use the same sounding cymbal setup you have, but it still sounds totally cool and is part of your sound and style. I agree, diversity is what makes it interesting. Great video, and thanks for taking the time to explain it so well. @aaronedgardrum Great response Aaron. I love how you﻿ are not precious with the some of the negative comments that goes with the Youtube territory. I myself would not use the same sounding cymbal setup you have, but it still sounds totally cool and is part of your sound and style. I agree, diversity is what makes it interesting. @aaronedgardrum Great response Aaron. I love how you are not precious with the some﻿ of the negative comments that goes with the Youtube territory. I myself would not use the same sounding cymbal setup you have, but it still sounds totally cool and is part of your sound and style. I agree, diversity is what makes it interesting. @aaronedgardrum Great response Aaron. I love how you are not precious with the some of the negative comments that goes with the Youtube territory. I myself would not use the same﻿ sounding cymbal setup you have, but it still sounds totally cool and is part of your sound and style. I agree, diversity is what makes it interesting. @aaronedgardrum Great response Aaron. I love how you are not precious with the some of the negative comments that goes with the Youtube territory. I myself would not use the same sounding cymbal setup you have, but﻿ it still sounds totally cool and is part of your sound and style. I agree, diversity is what makes it interesting. Great video,﻿ and thanks for taking the time to explain it so well. @aaronedgardrum Great response Aaron. I love how you are not precious with the some of the negative comments that goes with the Youtube territory. I myself would not use the same sounding cymbal setup you have, but it﻿ still sounds totally cool and is part of your sound and style. I agree, diversity is what makes it interesting. @aaronedgardrum Great response Aaron. I love how you are not precious with the some of the negative comments that goes with the Youtube territory. I myself would not use the same sounding cymbal setup you have, but it still sounds totally cool and is part of your sound and style. I agree, diversity is what makes it﻿ interesting. @aaronedgardrum Great response Aaron. I love how you are not precious with the some of the negative comments that goes with the Youtube territory. I myself would not use the same sounding cymbal﻿ setup you have, but it still sounds totally cool and is part of your sound and style. I agree, diversity is what makes it interesting. @aaronedgardrum Great response Aaron. I love how you are not precious with the some of the﻿ negative comments that goes with the Youtube territory. I myself would not use the same sounding cymbal setup you have, but it still sounds totally cool and is part of your sound and style. I agree, diversity is what makes it interesting. Great video, and thanks﻿ for taking the time to explain it so well. @aaronedgardrum Great response Aaron. I love how you are not precious﻿ with the some of the negative comments that goes with the Youtube territory. I myself would not use the same sounding cymbal setup you have, but it still sounds totally cool and is part of your sound and style. I agree, diversity is what makes it interesting. @aaronedgardrum Great response Aaron.﻿ I love how you are not precious with the some of the negative comments that goes with the Youtube territory. I myself would not use the same sounding cymbal setup you have, but it still sounds totally cool and is part of your sound and style. I agree, diversity is what makes it interesting. @aaronedgardrum Great response Aaron. I love how you are not precious with the some of the negative comments that goes with the Youtube territory. I myself would﻿ not use the same sounding cymbal setup you have, but it still sounds totally cool and is part of your sound and style. I agree, diversity is what makes it interesting. @aaronedgardrum Great response Aaron. I love how you are not precious with the some of the negative comments that goes with the Youtube territory. I myself would not use the same sounding cymbal setup you have, but it still sounds totally cool and is part﻿ of your sound and style. I agree, diversity is what makes it interesting. @aaronedgardrum Great response Aaron. I love how you are not precious with the some of the negative comments that goes﻿ with the Youtube territory. I myself would not use the same sounding cymbal setup you have, but it still sounds totally cool and is part of your sound and style. I agree, diversity is what makes it interesting. Great video, and thanks for taking﻿ the time to explain it so well. @aaronedgardrum Great response Aaron. I love how you are not precious with the some of the negative comments that goes with the Youtube territory. I myself would not use the same sounding cymbal setup you have, but it still sounds totally cool and is﻿ part of your sound and style. I agree, diversity is what makes it interesting. @aaronedgardrum Great response Aaron. I love how you are not precious with the some of the negative comments that goes with the Youtube territory. I myself would not use the same sounding cymbal setup you have, but it still sounds totally cool and is part of your sound and style. I﻿ agree, diversity is what makes it interesting. @aaronedgardrum Great response Aaron. I love how you are not precious with the some of the negative comments that goes with the Youtube territory. I myself would not use the same sounding cymbal setup you have, but it still sounds﻿ totally cool and is part of your sound and style. I agree, diversity is what makes it interesting. Great video, and thanks for taking the time to explain it so﻿ well. @aaronedgardrum Great response Aaron. I love how you are not precious with the some of the negative comments that goes with the Youtube territory. I myself would not use the same sounding cymbal setup you have, but it still sounds totally cool and is part of your﻿ sound and style. I agree, diversity is what makes it interesting. @aaronedgardrum﻿ Great response Aaron. I love how you are not precious with the some of the negative comments that goes with the Youtube territory. I myself would not use the same sounding cymbal setup you have, but it still sounds totally cool and is part of your sound and style. I agree, diversity is what makes it interesting. @aaronedgardrum Great response Aaron. I love how you are not precious with the some of the negative comments that goes with the Youtube territory. I myself would not﻿ use the same sounding cymbal setup you have, but it still sounds totally cool and is part of your sound and style. I agree, diversity is what makes it interesting. @aaronedgardrum Great response Aaron. I love how you are not precious with the some of the negative comments that goes with the Youtube territory. I myself would not use the same sounding cymbal setup you have, but it still sounds totally cool and is part of your sound﻿ and style. I agree, diversity is what makes it interesting. @aaronedgardrum Great response Aaron. I love how you are not precious with the some of the negative comments that goes with the Youtube territory. I﻿ myself would not use the same sounding cymbal setup you have, but it still sounds totally cool and is part of your sound and style. I agree, diversity is what makes it interesting. @aaronedgardrum Great response Aaron. I love how you are not precious with the some of the negative﻿ comments that goes with the Youtube territory. I myself would not use the same sounding cymbal setup you have, but it still sounds totally cool and is part of your sound and style. I agree, diversity is what makes it interesting. Great video, and thanks for﻿ taking the time to explain it so well. @aaronedgardrum Great response Aaron. I love how you are not﻿ precious with the some of the negative comments that goes with the Youtube territory. I myself would not use the same sounding cymbal setup you have, but it still sounds totally cool and is part of your sound and style. I agree, diversity is what makes it interesting. @aaronedgardrum Great response Aaron. I love how you are not precious with the some of the negative comments that goes with the Youtube territory. I myself would not use the same sounding cymbal setup you have, but it still sounds totally﻿ cool and is part of your sound and style. I agree, diversity is what makes it interesting. @aaronedgardrum Great response Aaron. I love how you are not precious with the some of the negative comments that goes with the Youtube territory. I myself would not use the same sounding cymbal setup you have,﻿ but it still sounds totally cool and is part of your sound and style. I agree, diversity is what makes it interesting. @aaronedgardrum Great response Aaron. I love how you are not precious with the some of the negative comments that goes with the Youtube territory. I myself would not use the same sounding cymbal setup you have, but it still sounds totally cool and is part of your sound and style. I agree, diversity is﻿ what makes it interesting. Great video, and thanks for taking the﻿ time to explain it so well. @aaronedgardrum Great response Aaron. I love how you are not precious with the some of the negative comments that goes with the Youtube territory. I myself﻿ would not use the same sounding cymbal setup you have, but it still sounds totally cool and is part of your sound and style. I agree, diversity is what makes it interesting. @aaronedgardrum Great response Aaron. I love how you are not precious with the some of the negative comments that goes with the Youtube territory.﻿ I myself would not use the same sounding cymbal setup you have, but it still sounds totally cool and is part of your sound and style. I agree, diversity is what makes it interesting. Great video, and thanks for taking the time to﻿ explain it so well. @aaronedgardrum Great response Aaron. I love how you are not precious with the some of the negative comments that goes with the Youtube territory. I myself would not use the same sounding cymbal setup you﻿ have, but it still sounds totally cool and is part of your sound and style. I agree, diversity is what makes it interesting. @aaronedgardrum Great﻿ response Aaron. I love how you are not precious with the some of the negative comments that goes with the Youtube territory. I myself would not use the same sounding cymbal setup you have, but it still sounds totally cool and is part of your sound and style. I agree, diversity is what makes it interesting. @aaronedgardrum Great response Aaron. I love how you are not precious with the some of﻿ the negative comments that goes with the Youtube territory. I myself would not use the same sounding cymbal setup you have, but it still sounds totally cool and is part of your sound and style. I agree, diversity is what makes it interesting. @aaronedgardrum Great response Aaron. I love how you are not precious with the some of the negative comments that goes with the Youtube territory. I myself would not use the same sounding cymbal setup you have, but it still sounds totally cool﻿ and is part of your sound and style. I agree, diversity is what makes it interesting. @aaronedgardrum Great response Aaron. I love how you are not precious with the some of the negative comments that goes with the Youtube territory. I myself would not use the same sounding cymbal setup you have, but it still﻿ sounds totally cool and is part of your sound and style. I agree, diversity is what makes it interesting. @aaronedgardrum Great response Aaron. I love how you are not precious with the some of the negative comments that﻿ goes with the Youtube territory. I myself would not use the same sounding cymbal setup you have, but it still sounds totally cool and is part of your sound and style. I agree, diversity is what makes it interesting. @aaronedgardrum Great response Aaron. I love how you are not precious with the some of the negative comments that goes with the Youtube territory. I myself would not use the same sounding cymbal setup you have, but it still sounds totally cool and is part of your sound and style. I agree, diversity is what makes﻿ it interesting. @aaronedgardrum Great response Aaron. I love how you are not precious with the some of the negative comments that goes with the Youtube territory. I myself would not use the﻿ same sounding cymbal setup you have, but it still sounds totally cool and is part of your sound and style. I agree, diversity is what makes it interesting. @aaronedgardrum Great response Aaron. I love how you are not precious with﻿ the some of the negative comments that goes with the Youtube territory. I myself would not use the same sounding cymbal setup you have, but it still sounds totally cool and is part of your sound and style. I agree, diversity is what makes it interesting. [..YouTube..] @aaronedgardrum Great response Aaron. I love how you are not precious with the some of the negative comments that goes with the Youtube territory. I myself would not use the same sounding cymbal setup you have, but it still sounds totally cool and is part of your sound and style. I agree, diversity is what makes it interesting. [..YouTube..] Great response Aaron. I love how you are not precious with the some of the negative comments that goes with the Youtube territory. I myself would not use the same sounding cymbal setup you have, but it still sounds totally cool and is part of your sound and style. I agree, diversity is what makes it interesting. Great response Aaron. I love how you are not precious with the some of the negative comments that goes with the Youtube territory. I myself would not use the same sounding cymbal setup you have, but it still sounds totally cool and is part of your sound and style. I agree, diversity is what makes it interesting. Each cymbal has its own place in its musical context, without any musical context how can anyone “not like” his cymbal set-up? It might fit his band perfect where a Zildjian A custom might drown out everything. Each cymbal﻿ has its own place in its musical context, without any musical context how can anyone “not like” his cymbal set-up? It might fit his band perfect where a Zildjian A custom might drown out everything. Each cymbal has its own place in its musical context, without any musical context how can anyone “not like” his cymbal set-up? It might fit his band perfect where a Zildjian A custom might drown﻿ out everything. Each cymbal has its own place in its musical context, without any musical﻿ context how can anyone “not like” his cymbal set-up? It might fit his band perfect where a Zildjian A custom might drown out everything. Each cymbal has its own place in its musical context, without any musical context how can anyone “not like” his cymbal set-up? It might fit his band perfect﻿ where a Zildjian A custom might drown out everything. Each cymbal has its own place in its musical context, without any﻿ musical context how can anyone “not like” his cymbal set-up? It might fit his band perfect where a Zildjian A custom might drown out everything. Each cymbal has﻿ its own place in its musical context, without any musical context how can anyone “not like” his cymbal set-up? It might fit his band perfect where a Zildjian A custom might drown out everything. Each cymbal has its own place in its﻿ musical context, without any musical context how can anyone “not like” his cymbal set-up? It might fit his band perfect where a Zildjian A custom might drown out everything. Each cymbal has its own place in its musical context, without any musical context how can﻿ anyone “not like” his cymbal set-up? It might fit his band perfect where a Zildjian A custom might drown out everything. Each cymbal has its own place in its musical context, without any musical context how can anyone “not like” his cymbal set-up? It might fit his band perfect where a Zildjian A custom﻿ might drown out everything. Each cymbal has its﻿ own place in its musical context, without any musical context how can anyone “not like” his cymbal set-up? It might fit his band perfect where a Zildjian A custom might drown out everything. Each cymbal has its own place in﻿ its musical context, without any musical context how can anyone “not like” his cymbal set-up? It might fit his band perfect where a Zildjian A custom might drown out everything. Each cymbal has its own place in its musical context, without any musical context how can anyone “not like” his cymbal set-up? It might fit his band perfect where a Zildjian A custom might﻿ drown out everything. Each cymbal has its own place in its musical context, without any musical context how can anyone “not like” his cymbal set-up? It might fit﻿ his band perfect where a Zildjian A custom might drown out everything. Each cymbal has its own place in its musical context, without any musical context how can anyone﻿ “not like” his cymbal set-up? It might fit his band perfect where a Zildjian A custom might drown out everything. Each cymbal has its own place in its musical context, without any musical context how can anyone “not﻿ like” his cymbal set-up? It might fit his band perfect where a Zildjian A custom might drown out everything. Each cymbal has its own place in its musical context, without any musical context how can anyone “not like” his cymbal set-up? It might fit his band perfect where a﻿ Zildjian A custom might drown out everything. Each﻿ cymbal has its own place in its musical context, without any musical context how can anyone “not like” his cymbal set-up? It might fit his band perfect where a Zildjian A custom might drown out everything. Each cymbal has its own place in its musical context, without any musical context how can anyone “not like” his cymbal set-up? It﻿ might fit his band perfect where a Zildjian A custom might drown out everything. Each cymbal has its own place in its musical context, without any musical context how﻿ can anyone “not like” his cymbal set-up? It might fit his band perfect where a Zildjian A custom might drown out everything. Each cymbal has its own place in its musical context, without any musical context how can anyone “not like” his cymbal set-up? It might fit his band perfect where a Zildjian A﻿ custom might drown out everything. Each cymbal has its own place in its musical context, without any musical context how can anyone “not like” his cymbal set-up? It might fit his band perfect where a Zildjian﻿ A custom might drown out everything. Each cymbal has its own place in its musical context, without any musical context how can anyone “not like” his cymbal set-up? It might﻿ fit his band perfect where a Zildjian A custom might drown out everything. Each cymbal has its own place in its musical context, without any musical context how can anyone “not like” his cymbal﻿ set-up? It might fit his band perfect where a Zildjian A custom might drown out everything. Each cymbal has its own place in its musical context,﻿ without any musical context how can anyone “not like” his cymbal set-up? It might fit his band perfect where a Zildjian A custom might drown out everything. Each cymbal has its own place in its musical context, without any musical context how can anyone “not like”﻿ his cymbal set-up? It might fit his band perfect where a Zildjian A custom might drown out everything. Each cymbal has its own place in its musical context, without any musical context how can anyone “not like” his cymbal set-up? It might fit his band perfect where a Zildjian A custom might drown out﻿ everything. Each cymbal has its own place in its musical context, without any musical context﻿ how can anyone “not like” his cymbal set-up? It might fit his band perfect where a Zildjian A custom might drown out everything. Each cymbal has its own place in its musical﻿ context, without any musical context how can anyone “not like” his cymbal set-up? It might fit his band perfect where a Zildjian A custom might drown out everything. Each cymbal has its own place in its musical context, without any musical context how can anyone “not like” his﻿ cymbal set-up? It might fit his band perfect where a Zildjian A custom might drown out everything. Each cymbal has its own place in its musical context, without any musical context how can anyone “not like” his cymbal set-up? It might fit his﻿ band perfect where a Zildjian A custom might drown out everything. Each cymbal has its own﻿ place in its musical context, without any musical context how can anyone “not like” his cymbal set-up? It might fit his band perfect where a Zildjian A custom might drown out everything. Each cymbal has its own place in its musical context, without any musical context how can anyone “not like” his cymbal set-up? It might fit his band﻿ perfect where a Zildjian A custom might drown out everything. Each cymbal has its own place in its musical context, without﻿ any musical context how can anyone “not like” his cymbal set-up? It might fit his band perfect where a Zildjian A custom might drown out everything. [..YouTube..] Each cymbal has its own place in its musical context, without any musical context how can anyone “not like” his cymbal set-up? It might fit his band perfect where a Zildjian A custom might drown out everything. In before @thelinedrummer gets here and leaves a comment about how nobody is as awesome as Mike Johnston and how it was actually Mike Johnston that invented soft-serve ice cream. Great job Aaron! In before @thelinedrummer gets here and leaves a comment about how nobody is as awesome as Mike Johnston and how it was﻿ actually Mike Johnston that invented soft-serve ice cream. Great job Aaron! In before @thelinedrummer gets here and leaves a comment about how nobody is as awesome as Mike Johnston and how it was actually Mike Johnston that invented soft-serve ice﻿ cream. Great job Aaron! In before @thelinedrummer gets here and leaves a comment about how nobody is as awesome﻿ as Mike Johnston and how it was actually Mike Johnston that invented soft-serve ice cream. Great job Aaron! In﻿ before @thelinedrummer gets here and leaves a comment about how nobody is as awesome as Mike Johnston and how it was actually Mike Johnston that invented soft-serve ice cream. Great job Aaron! In before @thelinedrummer gets here and leaves a comment about how nobody﻿ is as awesome as Mike Johnston and how it was actually Mike Johnston that invented soft-serve ice cream. Great job Aaron! In before﻿ @thelinedrummer gets here and leaves a comment about how nobody is as awesome as Mike Johnston and how it was actually Mike Johnston that invented soft-serve ice cream. Great job Aaron! In before @thelinedrummer gets here and leaves a comment about how nobody is as awesome as Mike Johnston and how it was actually Mike Johnston that invented﻿ soft-serve ice cream. Great job Aaron! In before @thelinedrummer gets here and leaves a comment about how nobody is as awesome as Mike﻿ Johnston and how it was actually Mike Johnston that invented soft-serve ice cream. Great job Aaron! In before @thelinedrummer gets here and leaves a comment about how nobody is as awesome as﻿ Mike Johnston and how it was actually Mike Johnston that invented soft-serve ice cream. Great job Aaron! In before @thelinedrummer gets here and leaves a comment about how nobody is as awesome as Mike Johnston﻿ and how it was actually Mike Johnston that invented soft-serve ice cream. Great job Aaron! In before @thelinedrummer gets here and leaves﻿ a comment about how nobody is as awesome as Mike Johnston and how it was actually Mike Johnston that invented soft-serve ice cream. Great job Aaron! In before @thelinedrummer gets﻿ here and leaves a comment about how nobody is as awesome as Mike Johnston and how it was actually Mike Johnston that invented soft-serve ice cream. Great job Aaron! In before @thelinedrummer gets here﻿ and leaves a comment about how nobody is as awesome as Mike Johnston and how it was actually Mike Johnston that invented soft-serve ice cream. Great job Aaron! In before @thelinedrummer gets here and leaves a comment about how nobody is as awesome as Mike Johnston and how it was actually Mike Johnston that invented soft-serve ice cream. Great job﻿ Aaron! In before @thelinedrummer gets here and leaves a comment about how nobody is as awesome as Mike Johnston and how it was actually﻿ Mike Johnston that invented soft-serve ice cream. Great job Aaron! In before @thelinedrummer gets here and leaves a comment about﻿ how nobody is as awesome as Mike Johnston and how it was actually Mike Johnston that invented soft-serve ice cream. Great job Aaron! In before @thelinedrummer gets here and leaves a comment about how nobody is as awesome as Mike Johnston and﻿ how it was actually Mike Johnston that invented soft-serve ice cream. Great job Aaron! In before @thelinedrummer gets here and leaves a comment about how nobody is as awesome as Mike Johnston and how﻿ it was actually Mike Johnston that invented soft-serve ice cream. Great job Aaron! In before @thelinedrummer gets here and leaves a comment about how nobody is as awesome as Mike Johnston and how it was actually Mike Johnston that﻿ invented soft-serve ice cream. Great job Aaron! In before @thelinedrummer﻿ gets here and leaves a comment about how nobody is as awesome as Mike Johnston and how it was actually Mike Johnston that invented soft-serve ice cream. Great job Aaron! In before @thelinedrummer gets here and leaves a comment about how nobody is as﻿ awesome as Mike Johnston and how it was actually Mike Johnston that invented soft-serve ice cream. Great job Aaron! In before @thelinedrummer gets here and leaves a comment about how nobody is as awesome as Mike Johnston and how it was actually Mike﻿ Johnston that invented soft-serve ice cream. Great job Aaron! In before @thelinedrummer gets here and leaves a comment about how nobody is as awesome as Mike Johnston and how it was actually Mike Johnston﻿ that invented soft-serve ice cream. Great job Aaron! In before @thelinedrummer gets here and leaves a comment about how nobody is as awesome as Mike Johnston and how it was actually Mike Johnston that invented soft-serve﻿ ice cream. Great job Aaron! In before @thelinedrummer gets here and leaves a comment about how nobody is as awesome as Mike Johnston and how it was actually Mike Johnston that invented soft-serve ice cream. Great﻿ job Aaron! In before @thelinedrummer gets here and leaves a comment about how﻿ nobody is as awesome as Mike Johnston and how it was actually Mike Johnston that invented soft-serve ice cream. Great job Aaron! In before @thelinedrummer gets here and leaves a comment about how nobody is as awesome as Mike Johnston and how it was actually Mike Johnston that invented soft-serve ice cream.﻿ Great job Aaron! [..YouTube..] In before @thelinedrummer gets here and leaves a comment about how nobody is as awesome as Mike Johnston and how it was actually Mike Johnston that invented soft-serve ice cream. Great job Aaron! Great job on these videos. You explain these difficult concepts in a simple and understandable way. And about your dark cymbal sounds, I like them. They aren’t something I would personally go for, but they give your kit a really unique voice. Great job on these videos. You explain these difficult concepts in a simple and understandable way. And about your dark cymbal sounds, I like them. They aren’t something I would personally go for,﻿ but they give your kit a really unique voice. Great job on these videos. You explain these difficult concepts in a simple and understandable way. And about your dark cymbal sounds, I like them. They aren’t something I would personally go for, but﻿ they give your kit a really unique voice. Great job on these videos. You explain these difficult concepts in a simple and﻿ understandable way. And about your dark cymbal sounds, I like them. They aren’t something I would personally go for, but they give your kit a really unique voice. Great job on these videos. You explain these difficult concepts in a simple and understandable way. And about your dark cymbal sounds, I like them. They aren’t something I would personally go for, but they give your kit﻿ a really unique voice. Great job on these videos. You﻿ explain these difficult concepts in a simple and understandable way. And about your dark cymbal sounds, I like them. They aren’t something I would personally go for, but they give your kit a really unique voice. Great job on these videos. You explain these difficult concepts in a simple and understandable way. And about your dark cymbal sounds, I like them. They aren’t something﻿ I would personally go for, but they give your kit a really unique voice. Great job on these videos. You explain these difficult concepts in a﻿ simple and understandable way. And about your dark cymbal sounds, I like them. They aren’t something I would personally go for, but they give your kit a really unique voice. Great job on these videos.﻿ You explain these difficult concepts in a simple and understandable way. And about your dark cymbal sounds, I like them. They aren’t something I would personally go for, but they give your kit a really unique voice. Great job on these videos. You explain these difficult concepts in a simple and understandable way. And about your dark cymbal sounds, I like them.﻿ They aren’t something I would personally go for, but they give your kit a really unique voice. Great job on these videos. You explain these difficult concepts in a simple and understandable way. And about your dark cymbal sounds, I like them. They aren’t something I would personally﻿ go for, but they give your kit a really unique voice. Great job on these videos. You explain these difficult concepts in a simple and understandable way. And about your dark cymbal sounds,﻿ I like them. They aren’t something I would personally go for, but they give your kit a really unique voice. Great job on these videos. You explain these﻿ difficult concepts in a simple and understandable way. And about your dark cymbal sounds, I like them. They aren’t something I would personally go for, but they give your kit a really unique voice. Great job on these videos. You explain these difficult concepts in a simple and understandable way. And about your dark cymbal sounds, I like them. They aren’t something I﻿ would personally go for, but they give your kit a really unique voice. Great job on these videos. You explain these difficult concepts in a simple and understandable way. And about your dark cymbal sounds, I like them. They aren’t something I would personally go for, but they give﻿ your kit a really unique voice. Great﻿ job on these videos. You explain these difficult concepts in a simple and understandable way. And about your dark cymbal sounds, I like them. They aren’t something I would personally go for, but they give your kit a really unique voice. Great job on these videos. You explain these difficult concepts in a simple and understandable way. And about your dark cymbal sounds, I like﻿ them. They aren’t something I would personally go for, but they give your kit a really unique voice. Great job on these videos. You explain these difficult concepts in a simple and understandable way. And about your dark cymbal sounds, I like them. They aren’t something I would﻿ personally go for, but they give your kit a really unique voice. Great job on these videos. You explain these difficult concepts in a simple and understandable way. And about your dark cymbal sounds, I like them. They aren’t something I would personally go﻿ for, but they give your kit a really unique voice. Great job on these videos. You explain these difficult concepts in a simple and understandable way. And about your dark cymbal sounds, I﻿ like them. They aren’t something I would personally go for, but they give your kit a really unique voice. Great job on these videos. You explain these difficult concepts in a simple and understandable way. And about your dark cymbal sounds, I like them. They aren’t something I would personally go for, but they give your﻿ kit a really unique voice. Great job﻿ on these videos. You explain these difficult concepts in a simple and understandable way. And about your dark cymbal sounds, I like them. They aren’t something I would personally go for, but they give your kit a really unique voice. Great job on these videos. You explain these difficult concepts in a simple and understandable﻿ way. And about your dark cymbal sounds, I like them. They aren’t something I would personally go for, but they give your kit a really unique voice. Great job on these videos. You explain these difficult concepts in﻿ a simple and understandable way. And about your dark cymbal sounds, I like them. They aren’t something I would personally go for, but they give your kit a really unique voice. Great job on these videos. You explain these difficult concepts in a simple and understandable way. And about your dark cymbal sounds, I like them. They aren’t﻿ something I would personally go for, but they give your kit a really unique voice. Great job on these videos. You explain these difficult concepts in a simple﻿ and understandable way. And about your dark cymbal sounds, I like them. They aren’t something I would personally go for, but they give your kit a really unique voice. Great job on these videos. You explain these difficult concepts in a simple and understandable way. And about﻿ your dark cymbal sounds, I like them. They aren’t something I would personally go for, but they give your kit a really unique voice. Great job on these videos. You explain﻿ these difficult concepts in a simple and understandable way. And about your dark cymbal sounds, I like them. They aren’t something I would personally go for, but they give your kit a really unique voice. Great job on these videos. You explain these difficult﻿ concepts in a simple and understandable way. And about your dark cymbal sounds, I like them. They aren’t something I would personally go for, but they give your kit a really unique voice. Great job on these videos. You explain these difficult concepts in a simple and understandable way. And about your dark cymbal sounds, I like them. They aren’t something I would personally go for, but they give your kit a﻿ really unique voice. Great job on these videos. You explain these difficult concepts﻿ in a simple and understandable way. And about your dark cymbal sounds, I like them. They aren’t something I would personally go for, but they give your kit a really unique voice. Great job on﻿ these videos. You explain these difficult concepts in a simple and understandable way. And about your dark cymbal sounds, I like them. They aren’t something I would personally go for, but they give your kit a really unique voice. Great job on these videos. You explain these difficult concepts in a simple and understandable way. And about your dark cymbal sounds, I like them. They aren’t something I would personally go for, but they give your kit a really unique﻿ voice. Great job on these videos. You explain these difficult concepts in a simple and understandable way. And about your dark cymbal sounds, I like them. They aren’t something I would personally go for, but they﻿ give your kit a really unique voice. Great job on these videos. You explain these difficult concepts in a simple and understandable way. And about your dark cymbal﻿ sounds, I like them. They aren’t something I would personally go for, but they give your kit a really unique voice. [..YouTube..] Great job on these videos. You explain these difficult concepts in a simple and understandable way. And about your dark cymbal sounds, I like them. They aren’t something I would personally go for, but they give your kit a really unique voice. [..YouTube..] awesome vid, so sweet! @deathwurst I see what you’re saying, but there’s a point in more rhythmically complex music where you have to know and understand this stuff to have a hope of figuring out what’s going on and being able to keep up. Most popular music wouldn’t really use many of the advanced techniques Aaron is teaching – you can of course easily play a rock or funk tune on feel alone, knowing nothing more than “backbeat on 2 and 4”. It gets a lot harder when you try to improvise to Tool or Periphery! @deathwurst I see what you’re saying, but there’s a point in more rhythmically complex music where you have to know and understand this stuff to have a hope of figuring out what’s going on and being able to keep up. Most popular music wouldn’t really use many of the advanced techniques Aaron is teaching – you can of course easily play a rock or﻿ funk tune on feel alone, knowing nothing more than “backbeat on 2 and 4”. It gets a lot harder when you try to improvise to Tool or Periphery! @deathwurst I see what you’re saying,﻿ but there’s a point in more rhythmically complex music where you have to know and understand this stuff to have a hope of figuring out what’s going on and being able to keep up. Most popular music wouldn’t really use many of the advanced techniques Aaron is teaching – you can of course easily play a rock or funk tune on feel alone, knowing nothing more than “backbeat on 2 and 4”. It gets a lot harder when you try to improvise to Tool or Periphery! @deathwurst I see what you’re saying, but there’s a point in more rhythmically complex music where you have to know and understand this stuff to have a hope of﻿ figuring out what’s going on and being able to keep up. Most popular music wouldn’t really use many of the advanced techniques Aaron is teaching – you can of course easily play a rock or funk tune on feel alone, knowing nothing more than “backbeat on 2 and 4”. It gets a lot harder when you try to improvise to Tool or Periphery! @deathwurst I see what you’re saying, but there’s a point in more rhythmically complex music where you have to know and understand this stuff to﻿ have a hope of figuring out what’s going on and being able to keep up. Most popular music wouldn’t really use many of the advanced techniques Aaron is teaching – you can of course easily play a rock or funk tune on feel alone, knowing nothing more than “backbeat on 2 and 4”. It gets a lot harder when you try to improvise to Tool or Periphery! @deathwurst I see what you’re saying, but there’s a point in more rhythmically complex music where you have to know and understand this stuff to have a hope of figuring out what’s going﻿ on and being able to keep up. Most popular music wouldn’t really use many of the advanced techniques Aaron is teaching – you can of course easily play a rock or funk tune on feel alone, knowing nothing more than “backbeat on 2 and 4”. It gets a lot harder when you try to improvise to Tool or Periphery! @deathwurst I see what you’re saying, but there’s a point in more rhythmically complex music where you have to know and understand this stuff to have a hope of figuring out what’s going on and being able to keep up. Most popular music wouldn’t really use many of the advanced techniques Aaron is teaching – you can of course easily play a rock or funk tune on feel alone, knowing nothing more than “backbeat on 2 and 4”. It gets﻿ a lot harder when you try to improvise to Tool or Periphery! @deathwurst I see what you’re saying, but there’s a point in more rhythmically complex music where you have to know and understand this stuff to have a hope of figuring out what’s going on and being able to keep up. Most popular music wouldn’t really use many of the﻿ advanced techniques Aaron is teaching – you can of course easily play a rock or funk tune on feel alone, knowing nothing more than “backbeat on 2 and 4”. It gets a lot harder when you try to improvise to Tool or Periphery! @deathwurst I see what you’re saying, but there’s a point in more rhythmically complex music where you have to know and understand this stuff to have a hope of figuring out what’s going on and being able to keep up. Most popular music wouldn’t really use many of the advanced techniques Aaron is teaching – you can of course easily play a rock or funk tune on feel alone, knowing nothing more than “backbeat on 2﻿ and 4”. It gets a lot harder when you try to improvise to Tool or Periphery! @deathwurst I see what you’re saying, but there’s a point in more rhythmically complex music where you have to know and understand this stuff to have a hope of figuring out what’s going on and being able to keep up. Most popular music wouldn’t really use many of the advanced techniques Aaron is teaching – you can of course easily play a rock﻿ or funk tune on feel alone, knowing nothing more than “backbeat on 2 and 4”. It gets a lot harder when you try to improvise to Tool or Periphery! @deathwurst I see what you’re saying, but there’s a point in more rhythmically complex music where you have to know and understand this stuff to have a hope of figuring out what’s going on and being able to keep up. Most popular music wouldn’t﻿ really use many of the advanced techniques Aaron is teaching – you can of course easily play a rock or funk tune on feel alone, knowing nothing more than “backbeat on 2 and 4”. It gets a lot harder when you try to improvise to Tool or Periphery! @deathwurst I see what you’re saying, but there’s a point in more rhythmically complex music where you have to know and understand this stuff﻿ to have a hope of figuring out what’s going on and being able to keep up. Most popular music wouldn’t really use many of the advanced techniques Aaron is teaching – you can of course easily play a rock or funk tune on feel alone, knowing nothing more than “backbeat on 2 and 4”. It gets a lot harder when you try to improvise to Tool or Periphery! @deathwurst I see what you’re saying, but there’s﻿ a point in more rhythmically complex music where you have to know and understand this stuff to have a hope of figuring out what’s going on and being able to keep up. Most popular music wouldn’t really use many of the advanced techniques Aaron is teaching – you can of course easily play a rock or funk tune on feel alone, knowing nothing more than “backbeat on 2 and 4”. It gets a lot harder when you try to improvise to Tool or Periphery! @deathwurst I see what you’re saying, but there’s a point in more rhythmically complex music where you have to know and understand this stuff to have a hope of figuring out what’s going on and being able to keep up. Most popular music wouldn’t really use many of the advanced techniques Aaron is teaching﻿ – you can of course easily play a rock or funk tune on feel alone, knowing nothing more than “backbeat on 2 and 4”. It gets a lot harder when you try to improvise to Tool or Periphery! @deathwurst I see what you’re saying, but there’s a point in more rhythmically complex music where you have to know and understand this stuff to have a hope of figuring out what’s going on and being able to keep up. Most popular music﻿ wouldn’t really use many of the advanced techniques Aaron is teaching – you can of course easily play a rock or funk tune on feel alone, knowing nothing more than “backbeat on 2 and 4”. It gets a lot harder when you try to improvise to Tool or Periphery! @deathwurst I see what you’re saying, but﻿ there’s a point in more rhythmically complex music where you have to know and understand this stuff to have a hope of figuring out what’s going on and being able to keep up. Most popular music wouldn’t really use many of the advanced techniques Aaron is teaching – you can of course easily play a rock or funk tune on feel alone, knowing nothing more than “backbeat on 2 and 4”. It gets a lot harder when you try to improvise to Tool or Periphery! @deathwurst I see what you’re saying, but there’s a point in more rhythmically complex music where you have to know and understand this stuff to have a hope of figuring out what’s going on and being able to keep up. Most popular music wouldn’t really use﻿ many of the advanced techniques Aaron is teaching – you can of course easily play a rock or funk tune on feel alone, knowing nothing more than “backbeat on 2 and 4”. It gets a lot harder when you try to improvise to Tool or Periphery! @deathwurst I see what you’re saying, but there’s a point in more rhythmically complex music where you have to know and understand this stuff to have a hope of figuring out what’s going on and being able to keep up. Most popular music wouldn’t really use many of the advanced techniques Aaron is teaching – you can of course easily play a rock or funk tune on feel alone, knowing nothing more than “backbeat on 2 and 4”. It gets a lot﻿ harder when you try to improvise to Tool or Periphery! @deathwurst I see what you’re saying, but there’s a point in more rhythmically complex music where you have to know and understand this stuff to have a hope of figuring out what’s going on and being able to keep up. Most popular music wouldn’t really use many of the advanced techniques Aaron is teaching – you can of course easily play a rock or funk tune﻿ on feel alone, knowing nothing more than “backbeat on 2 and 4”. It gets a lot harder when you try to improvise to Tool or Periphery! @deathwurst I see what you’re saying, but there’s a point in more﻿ rhythmically complex music where you have to know and understand this stuff to have a hope of figuring out what’s going on and being able to keep up. Most popular music wouldn’t really use many of the advanced techniques Aaron is teaching – you can of course easily play a rock or funk tune on feel alone, knowing nothing more than “backbeat on 2 and 4”. It gets a lot harder when you try to improvise to Tool or Periphery! @deathwurst I see what you’re saying, but there’s a point in more rhythmically complex music where you have to know and understand this stuff to have a hope of figuring out what’s going on﻿ and being able to keep up. Most popular music wouldn’t really use many of the advanced techniques Aaron is teaching – you can of course easily play a rock or funk tune on feel alone, knowing nothing more than “backbeat on 2 and 4”. It gets a lot harder when you try to improvise to Tool or Periphery! @deathwurst I see what you’re saying, but there’s a point in﻿ more rhythmically complex music where you have to know and understand this stuff to have a hope of figuring out what’s going on and being able to keep up. Most popular music wouldn’t really use many of the advanced techniques Aaron is teaching – you can of course easily play a rock or funk tune on feel alone, knowing nothing more than “backbeat on 2 and 4”. It gets a lot harder when you try to improvise to Tool or Periphery! @deathwurst I see what you’re saying, but there’s a point in more rhythmically complex music where you have to know and understand this stuff to have a hope of figuring out what’s going on and being able to keep up. Most popular music wouldn’t really use many of the advanced techniques Aaron is teaching – you can of course easily play a rock or funk tune on feel﻿ alone, knowing nothing more than “backbeat on 2 and 4”. It gets a lot harder when you try to improvise to Tool or Periphery! @deathwurst I see what you’re saying, but there’s a point in more rhythmically complex music where you have to know and understand this stuff to have a hope of figuring out what’s going on and being able to keep up. Most popular music wouldn’t really use many of the advanced techniques Aaron is teaching -﻿ you can of course easily play a rock or funk tune on feel alone, knowing nothing more than “backbeat on 2 and 4”. It gets a lot harder when you try to improvise to Tool or Periphery! @deathwurst I see what you’re saying, but there’s a point﻿ in more rhythmically complex music where you have to know and understand this stuff to have a hope of figuring out what’s going on and being able to keep up. Most popular music wouldn’t really use many of the advanced techniques Aaron is teaching – you can of course easily play a rock or funk tune on feel alone, knowing nothing more than “backbeat on 2 and 4”. It gets a lot harder when you try to improvise to Tool or Periphery! @deathwurst I see what you’re saying, but there’s a point in more rhythmically complex music where you have to know and understand this stuff to have a hope of figuring out what’s going on and being able﻿ to keep up. Most popular music wouldn’t really use many of the advanced techniques Aaron is teaching – you can of course easily play a rock or funk tune on feel alone, knowing nothing more than “backbeat on 2 and 4”. It gets a lot harder when you try to improvise to Tool or Periphery! @deathwurst I see what you’re saying, but there’s a point in more rhythmically complex music where you have to know and﻿ understand this stuff to have a hope of figuring out what’s going on and being able to keep up. Most popular music wouldn’t really use many of the advanced techniques Aaron is teaching – you can of course easily play a rock or funk tune on feel alone, knowing nothing more than “backbeat on 2 and 4”. It gets a lot harder when you try to improvise to Tool or Periphery! @deathwurst I see what﻿ you’re saying, but there’s a point in more rhythmically complex music where you have to know and understand this stuff to have a hope of figuring out what’s going on and being able to keep up. Most popular music wouldn’t really use many of the advanced techniques Aaron is teaching – you can of course easily play a rock or funk tune on feel alone, knowing nothing more than “backbeat on 2 and 4”. It gets a lot harder when you try to improvise to Tool or Periphery! @deathwurst I see what you’re saying, but there’s a point in more rhythmically complex music where you have to know and understand this stuff to have a hope of figuring out what’s going on and being able to keep up.﻿ Most popular music wouldn’t really use many of the advanced techniques Aaron is teaching – you can of course easily play a rock or funk tune on feel alone, knowing nothing more than “backbeat on 2 and 4”. It gets a lot harder when you try to improvise to Tool or Periphery! @deathwurst I see what you’re saying, but there’s a point in more rhythmically complex music where you have to know and understand this stuff to have a hope of figuring out what’s going on and being able to keep up. Most popular music wouldn’t really use many of the advanced techniques Aaron is teaching – you can of course easily play a rock or funk tune on feel alone, knowing nothing more than “backbeat on 2 and 4”. It gets a lot harder when you try to improvise to Tool or﻿ Periphery! @deathwurst I﻿ see what you’re saying, but there’s a point in more rhythmically complex music where you have to know and understand this stuff to have a hope of figuring out what’s going on and being able to keep up. Most popular music wouldn’t really use many of the advanced techniques Aaron is teaching – you can of course easily play a rock or funk tune on feel alone, knowing nothing more than “backbeat on 2 and 4”. It gets a lot harder when you try to improvise to Tool or Periphery! @deathwurst I see what you’re saying, but there’s a point in more rhythmically complex music where you have to know and understand this stuff to have a hope of figuring﻿ out what’s going on and being able to keep up. Most popular music wouldn’t really use many of the advanced techniques Aaron is teaching – you can of course easily play a rock or funk tune on feel alone, knowing nothing more than “backbeat on 2 and 4”. It gets a lot harder when you try to improvise to Tool or Periphery! @deathwurst I see what you’re saying, but there’s a point in more rhythmically complex music where you have to know and understand this stuff to have a hope of figuring out what’s going on and being able to keep up. Most popular music wouldn’t really use many of the advanced techniques Aaron is teaching – you can﻿ of course easily play a rock or funk tune on feel alone, knowing nothing more than “backbeat on 2 and 4”. It gets a lot harder when you try to improvise to Tool or Periphery! @deathwurst I see what you’re saying, but there’s a point in more rhythmically complex music where you have to know and understand this stuff to have a hope of figuring out what’s going on and being able to keep up. Most popular music wouldn’t really use many of the advanced techniques Aaron is teaching – you can of course easily play a rock or funk tune on feel alone, knowing nothing more than “backbeat on 2 and﻿ 4”. It gets a lot harder when you try to improvise to Tool or Periphery! @deathwurst I see what you’re saying, but there’s a point in more rhythmically complex music where you have to know and understand this stuff to have a hope of figuring out what’s going on and being able to keep up. Most popular music wouldn’t really use many of the advanced techniques Aaron is teaching – you can of course easily play a rock or funk tune on feel alone, knowing nothing﻿ more than “backbeat on 2 and 4”. It gets a lot harder when you try to improvise to Tool or Periphery! @deathwurst I see what you’re saying, but there’s a point in more rhythmically complex﻿ music where you have to know and understand this stuff to have a hope of figuring out what’s going on and being able to keep up. Most popular music wouldn’t really use many of the advanced techniques Aaron is teaching – you can of course easily play a rock or funk tune on feel alone, knowing nothing more than “backbeat on 2 and 4”. It gets a lot harder when you try to improvise to Tool or Periphery! @deathwurst I see what you’re﻿ saying, but there’s a point in more rhythmically complex music where you have to know and understand this stuff to have a hope of figuring out what’s going on and being able to keep up. Most popular music wouldn’t really use many of the advanced techniques Aaron is teaching – you can of course easily play a rock or funk tune on feel alone, knowing nothing more than “backbeat on 2 and 4”. It gets a lot harder when you try to improvise to Tool or Periphery! @deathwurst I see what you’re saying, but there’s a point in more rhythmically complex music where you have to know and understand this stuff to have a hope of figuring out what’s going on and being able to keep up. Most popular music wouldn’t really use many of the advanced techniques Aaron﻿ is teaching – you can of course easily play a rock or funk tune on feel alone, knowing nothing more than “backbeat on 2 and 4”. It gets a lot harder when you try to improvise to Tool or Periphery! @deathwurst I see what you’re saying, but there’s a point in more rhythmically complex music where you have to know and understand this stuff to have a hope of figuring out what’s going on and being able to keep up. Most popular music wouldn’t really use many of the advanced techniques Aaron is teaching – you can of course easily﻿ play a rock or funk tune on feel alone, knowing nothing more than “backbeat on 2 and 4”. It gets a lot harder when you try to improvise to Tool or Periphery! @deathwurst I see what you’re saying, but there’s a﻿ point in more rhythmically complex music where you have to know and understand this stuff to have a hope of figuring out what’s going on and being able to keep up. Most popular music wouldn’t really use many of the advanced techniques Aaron is teaching – you can of course easily play a rock or funk tune on feel alone, knowing nothing more than “backbeat on 2 and 4”. It gets a lot harder when you try to improvise to Tool or Periphery! @deathwurst I see what you’re saying, but there’s a point in more rhythmically complex music where you have to know﻿ and understand this stuff to have a hope of figuring out what’s going on and being able to keep up. Most popular music wouldn’t really use many of the advanced techniques Aaron is teaching – you can of course easily play a rock or funk tune on feel alone, knowing nothing more than “backbeat on 2 and 4”. It gets a lot harder when you try to improvise to Tool or Periphery! @deathwurst I see what you’re saying, but there’s a point in more rhythmically complex music where you have to know and understand this stuff to have a hope of figuring out what’s going on and being able to keep up. Most popular music wouldn’t really use many of﻿ the advanced techniques Aaron is teaching – you can of course easily play a rock or funk tune on feel alone, knowing nothing more than “backbeat on 2 and 4”. It gets a lot harder when you try to improvise to Tool or Periphery! @deathwurst I see what you’re saying, but there’s a point in more rhythmically complex music where you have to know and understand this stuff to have a hope of figuring out what’s﻿ going on and being able to keep up. Most popular music wouldn’t really use many of the advanced techniques Aaron is teaching – you can of course easily play a rock or funk tune on feel alone, knowing nothing more than “backbeat on 2 and 4”. It gets a lot harder when you try to improvise to Tool or Periphery! @deathwurst I see what you’re saying, but there’s a point in more rhythmically complex music where you﻿ have to know and understand this stuff to have a hope of figuring out what’s going on and being able to keep up. Most popular music wouldn’t really use many of the advanced techniques Aaron is teaching – you can of course easily play a rock or funk tune on feel alone, knowing nothing more than “backbeat on 2 and 4”. It gets a lot harder when you try to improvise to Tool or Periphery! @deathwurst I see what you’re saying, but there’s a point in more rhythmically complex music where you have to know and understand this﻿ stuff to have a hope of figuring out what’s going on and being able to keep up. Most popular music wouldn’t really use many of the advanced techniques Aaron is teaching – you can of course easily play a rock or funk tune on feel alone, knowing nothing more than “backbeat on 2 and 4”. It gets a lot harder when you try to improvise to Tool or Periphery! @deathwurst I see what you’re saying, but there’s a point in more rhythmically complex music where you have to know and understand this stuff to have a hope of figuring out what’s going on and being able to keep up. Most popular music wouldn’t really use many﻿ of the advanced techniques Aaron is teaching – you can of course easily play a rock or funk tune on feel alone, knowing nothing more than “backbeat on 2 and 4”. It gets a lot harder when you try to improvise to Tool or Periphery! @deathwurst I see what you’re saying, but there’s a point in more rhythmically complex music where you have to know and understand this stuff to have a hope of figuring out what’s going on and being able to keep up. Most popular music wouldn’t really use many of the advanced techniques Aaron is teaching – you can of course easily play a rock or funk tune on feel alone, knowing﻿ nothing more than “backbeat on 2 and 4”. It gets a lot harder when you try to improvise to Tool or Periphery! @deathwurst I see what you’re saying, but there’s a point in more rhythmically complex music where you have to know and understand﻿ this stuff to have a hope of figuring out what’s going on and being able to keep up. Most popular music wouldn’t really use many of the advanced techniques Aaron is teaching – you can of course easily play a rock or funk tune on feel alone, knowing nothing more than “backbeat on 2 and 4”. It gets a lot harder when you try to improvise to Tool or Periphery! [..YouTube..] @deathwurst I see what you’re saying, but there’s a point in more rhythmically complex music where you have to know and understand this stuff to have a hope of figuring out what’s going on and being able to keep up. Most popular music wouldn’t really use many of the advanced techniques Aaron is teaching – you can of course easily play a rock or funk tune on feel alone, knowing nothing more than “backbeat on 2 and 4”. It gets a lot harder when you try to improvise to Tool or Periphery! [..YouTube..] I see what you’re saying, but there’s a point in more rhythmically complex music where you have to know and understand this stuff to have a hope of figuring out what’s going on and being able to keep up. Most popular music wouldn’t really use many of the advanced techniques Aaron is teaching – you can of course easily play a rock or funk tune on feel alone, knowing nothing more than “backbeat on 2 and 4”. It gets a lot harder when you try to improvise to Tool or Periphery! I see what you’re saying, but there’s a point in more rhythmically complex music where you have to know and understand this stuff to have a hope of figuring out what’s going on and being able to keep up. Most popular music wouldn’t really use many of the advanced techniques Aaron is teaching – you can of course easily play a rock or funk tune on feel alone, knowing nothing more than “backbeat on 2 and 4”. It gets a lot harder when you try to improvise to Tool or Periphery! [..YouTube..] Hey man, great lessons, but your PDF’s don’t work…..
Hey man, great lessons, but your PDF’s don’t work…..
[..YouTube..] didn’t you change the tempo? i dont’ get it! its confuising! didn’t you change the tempo? i dont’ get it! its confuising!